Many people make the big mistake of over packing. Over packing causes more headaches than it’s worth including the obvious hassle of fishing through your entire wardrobe in a suitcase or two, comes the overweight or extra bag airline imposed fee. First, determine the exact nature of your trip. If it is for fun and relaxation, then formal clothes are probably not required. Although you may occasionally choose to be more refined for a local dinner out, be assured that dinner at a Caribbean beach or mountain hideaway is not going to require the same effort. Secondly, are you travelling purely for vacation, or is there some business mixed in as well? Perhaps, this is a primarily business trip, but you may have some time off to relax. Make sure you pack what you will need for either activity. 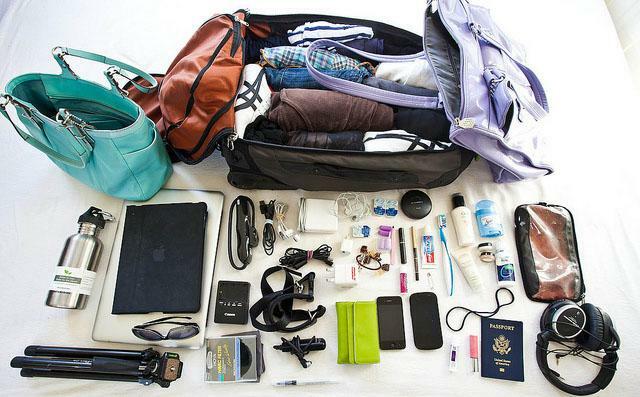 In all travel scenarios, you want to ensure you are ready for anything. Always bring a dark pair of pants, or khakis if travelling to a warmer climate. Something that adds just a touch of formal to any top is preferred. A black top or tee shirt will prove invaluable. It will easily add a touch of class to any outfit and may be worn more than once if need be. Other colour essentials are white and grey. These colour combos easily mix and match for any occasion. You will want to add some colour pieces and a patterned top or two. A pair of sneakers, hiking boots, or comfortable walking shoes is necessary. Try finding a casual pair of shoes with a touch of brown and black that will go with any outfit you need. This colour scheme will allow for a more formal touch when wearing black, yet a more casual look when in khakis. The key is to be able to go from very casual to a little more formal. You can come straight from the beach and head to a nice lunch with a few proper accessories. For the women bring a nice pair of sandals in your bag, a light cover up and even a pair of earrings or necklace. In this current state of travel, there is a 3oz liquid carry-on rule to all airlines. Invest in some inexpensive plastic travel containers for your favourite shampoo, conditioner and gels. Most advise you to pack the full container into your checked-in luggage. Although great advice, this may prove not so convenient when the airline loses your luggage, leaving you with only the airport gift shop to find a replacement. A good rule of thumb is to carry on a back pack with only the 3oz’s each of your liquid necessities, a pair of sandals if wearing your casual shoes, a change of undergarments and of course all money, tickets and identification. A few staple pieces of clothes and a smartly packed carry on can mean the world of difference and comfort when travelling. Tim Wain, is a guest travel writer for Hotels-Fairy.com.